The Maroons suffered a tough loss Wednesday evening and will have to head into a busy weekend with disappointment still lingering, having allowed Elmhurst to sneak away with a walk-off victory. 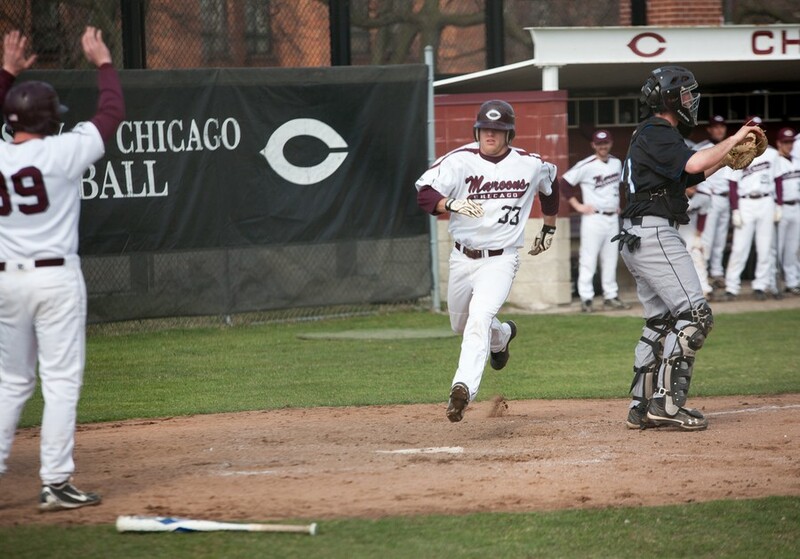 Chicago’s (16–9) hitting remained potent, but the Maroons’ pitching was unable to hold a two-run lead in the bottom of the ninth as Elmhurst (14–14) had the last word in a 13–12 victory. The South Siders were hitless through two innings, but thanks to a patient approach at the plate and some wayward pitching by Elmhurst, they plated five runs in the third. Fourth-year catcher Tony Logli walked to lead off the inning. Fourth-year center fielder Ben Bullock recorded a walk of his own, putting two on with none out. With one out, fourth-year left fielder Jack Cinoman was hit by a pitch to load the bases. The Maroons scored their first two runs without recording a hit. Second-year third baseman Kyle Engel and third-year DH Ricky Troncelliti walked back-to-back to put Chicago up by two. With two outs, a Chicago hit finally contributed to the scoring. A single to left by fourth-year first baseman J.R. Lopez gave the Maroons a 4–0 lead. The South Siders scored their fifth and final run of the inning when Logli drove in Troncelliti with another walk. The Maroons batted around having recorded only one hit. “We had a good approach at the plate and swung at strikes,” Troncelliti said. The Blue Jays countered with a run in the bottom of the third, but the South Siders quickly regained their momentum in the fourth, again courtesy of some poor pitching from Elmhurst. Kyle Engel singled and took second on a wild pitch, Troncelliti walked, and both advanced again on another wild pitch. Third-year outfielder Brett Huff walked to load the bases for Lopez, who quickly unloaded them with a bases-clearing double that put the Maroons up 8–1. Elmhurst whittled away at the Chicago lead, scoring twice in the fourth on two RBI singles, before breaking out in the sixth inning to score five runs on five hits. With the game tied 8–8 in the eighth, Engel hit a lead-off single. Troncelliti collected his fourth walk of the day, and with one out Lopez advanced the runners with another single. Chicago then recorded back-to-back-to-back hits to lead by four, their first real offensive showing of the game. Elmhurst responded quickly, putting up two runs in the bottom half of the inning and shutting out the Maroons in the top of the ninth. Everything seemed to fall apart for the South Siders in the bottom of the ninth. The frame began with two walks by fourth-year pitcher Drew Nicholson, who was then replaced by second-year Andrew VanWazer. With the bases loaded, the Blue Jays trimmed Chicago’s lead to one with a single. After a strikeout from VanWazer, Elmhurst first baseman Luke Collins drove in the winning runs with an RBI single. The Maroons’ offense continued to excel at Elmhurst. Not only did they record 10 hits, but they also showed commendable patience, racking up 11 walks. Unfortunately, Chicago’s pitching was not able to give its offense the support it needed, allowing 18 hits and walking five batters in what was an error-strewn game for both teams. The South Siders will be hoping their defense can match their offense this weekend as they face Wash U (20–12) in two doubleheaders on Saturday and Sunday at Stagg Field.